I did not serve spoiled milk. I thought about fretting over what to have for snacks. I fear cooking for other people, so no dinner was made. 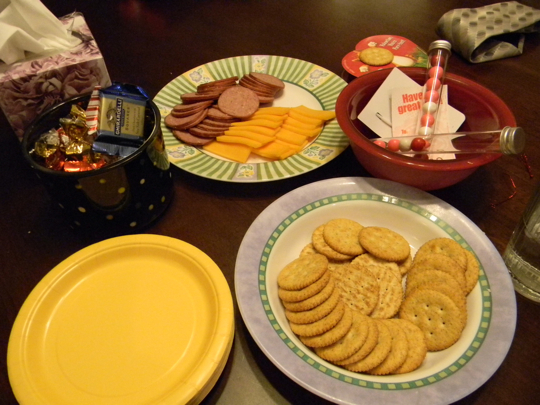 Instead, after everyone ate we gathered around a motley assortment of leftover Valentine cookies from work today, Valentine candy from my kids, cheese, crackers, sausage, nuts, and a container of Christmas candy. Don’t tell me I don’t know how to set out a spread. Yes, gum balls. They were good until you put them in your mouth. And I think the whole purpose of snacks is to have lots of variation. So you done good!